The Beatles 50 Years Ago Today: March 1, 1967. Beatles Radio: The Beatles, Solos, Covers, Birthdays, News The Fab 4 and More! 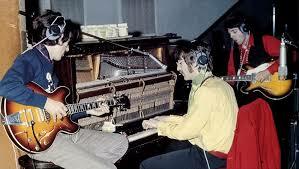 Seven takes of "Lucy In The Sky With Diamonds" were recorded in this 7:00 pm to 2:15 am session and then the seventh was reduced into take eight, ready for overdubbing. The first task of this session, was to add a new piano track onto take six of "A Day In The Life", an odd move considering hat the master mono and stereo mixes had already been made. Whatever the purpose, this additional overdub went unused.